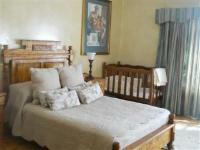 2 bedroom and 2 bathroom log home , 2 single beds and one double bed . fully equiped , aircon , electric blanket in winter. 3 course dinners R210 and breakfast R90 can be booked. If cancelling 0 day before arrival, forfeit 100% of the deposit. If cancelling 3 days before arrival, forfeit 80% of the deposit. If cancelling 4 days before arrival, forfeit 20% of the deposit. Deposits is for beds only, breakfast and dinners are additional. Breakfast R90 pp. Dinner R210 (for a big three course meal).